Fair Cash Offer in 24 Hours Guaranteed! No Fees. No Realtor Commissions. Put More Cash In Your Pocket. Sell Your Minnesota House For TOP Dollar. We close quickly on your terms; You pick the date with our All-Cash deal! We Buy Houses Anywhere In Minneapolis And Other Parts of Minnesota, And At Any Price. Check Out How Our Process Works. We’re Ready To Give You A Fair Cash Offer For Your Minnesota House. 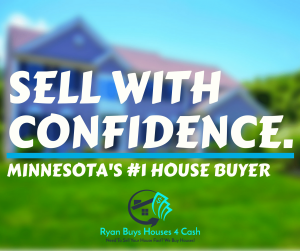 If you want to sell your house in Minnesota… we’re ready to give you a fair all-cash offer and close on your terms. Picture yourself putting money in your pocket and walking away from the house on your terms! With us, it’s easy and simple to sell a house fast in Minnesota today. We Buy Houses Minnesota! When you sell your house to Ryan Buys Houses 4 Cash there’s no waiting, less paperwork, and nothing you need to do to get your house ready to sell. We make the process of selling your house in Minnesota very easy. Our promise to you is to make the process of selling your house in Minnesota 100% stress-free. 4 simple steps are all it takes to get cash for your house. Begin by submitting your address in the form above. Deal with a local Minnesota house buyer that you can trust. We give you a fair evaluation of your house and move quickly to put cash in your hands with a simple closing. If you want less stress and to sell your Minnesota house fast as-is… we’re ready to give you a fair all-cash offer. We buy houses in Minnesota and want to add you to our list of satisfied clients today! 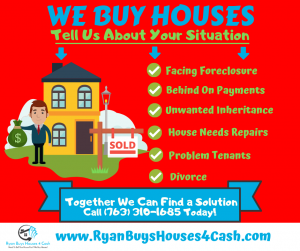 Basically what it comes down to is… if you have a property and need to sell it… we buy houses for cash in Minneapolis and we’d love to make you a fair cash offer today! 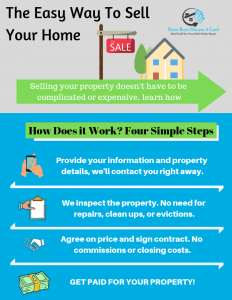 Do You Need To Sell Your House in Minnesota? 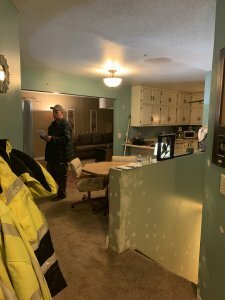 Sell Your Minnesota House Fast For Cash! We Buy Houses Minnesota! Sell Your House Fast Minnesota. We can identify very quickly if we will be a good fit. Unlike selling through an agent, you don’t have to waste your valuable time to see if the buyer can get financing… we’re ready to buy right now! Why Go With a Cash Buyer in Minnesota? Cash is king. You’ve heard that expression before and it is very true… especially in the case of real estate. If you’re looking to sell your Minnesota house, or anywhere else for that matter, the quickest, simplest and least amount of headaches will be with that of a cash buyer. When you sell your house the traditional route there will be a bank involved. And with a bank comes along a bevy of other roadblocks that can get in the way of a quick and smooth closing. When you list your property with a real-estate agent occasionally cash offers will come along. But the quickest way to attract cash buyers is selling your house off-market to investors. Some cash buyers won’t ask for an inspection or even appraisal. Avoid annoying fees. The real-estate agent fees, as well as other extraneous fees they nab you with at the end, can all be avoided. Speed. There is no quicker way to get rid of your house than with an all-cash transaction. Actually close. The amount of times a sale falls through the traditional route continues to rise. Fail rates have been going up since 2014 with it doubling from 2015 to ‘16. Don’t fix anything. When you sell the traditional route, the buyer gets an inspection. Then they request items for you to fix and if you say ‘no’ you risk them walking away for good. Cash buyers know what they’re getting into. The process is quite simple. If you are looking to sell your Minnesota house for cash, the steps are reduced significantly. The first step is to enter your contact information and property details, someone from our team will reach out to you within 24 hours. 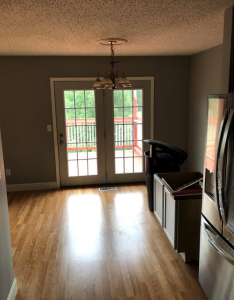 We will then schedule an appointment to meet with you to take a look at the property. Next, we will do our due diligence and take a look at comparable properties that recently sold in the area. If the property meets our criteria, we will then make you a fair all-cash offer and sign the paperwork with you. We pay all closing costs and accept no realtor commissions. You get paid for your property! It’s really that simple. Looking to sell your house fast in Minnesota? Receive an all-cash offer today! That’s the beauty of selling your Minneapolis house for cash to Ryan Buys Houses 4 Cash. We do not ask for appraisals. We do not need to wait for approval from a bank. If you’re ever thinking, I need to sell my house fast for cash, we are Minneapolis’s most trusted cash-home buyers. No matter what condition your house is in; no matter what situation or timeframe you’re facing… we buy houses in Minnesota! If you need to stop foreclosure in Minnesota or just need foreclosure help in Minnesota, we are here to help you out in this difficult time. We buy houses when you need to sell fast so you don’t lose your house to the bank and end up walking away with nothing. 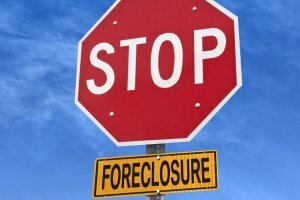 We have helped tons of Minnesota homeowners save their house from foreclosure. Property taxes in Minnesota are rising quicker than any other state! If you can’t afford to keep up with those payments, we understand completely. Life can take us by storm and situations come up all the time. Bills can get out of hand; if you’re behind on property taxes and are in jeopardy of losing your Minnesota house, we can help facilitate a quick cash transaction to help retain some of your built-in equity on the house before you lose it. And when you work with us, you won’t hurt your credit score, as you would if you filed for bankruptcy, went through foreclosure, or did a short sale. The sale of your Minnesota home can help you achieve that. We do ALL the work and we will clean up after you. Leave those unwanted items behind and we will take care of it. We make it easy and hassle-free for you. Sell your Minnesota house the 100% stress-free way today. A/C Unit burning a hole in your pocket? Want to sell your house online? If you inherited a property in Minnesota from across the country and do not want to hop on a plane just to make a sale on a house you don’t even want; we can help you sell your inherited house in Minnesota! We buy houses in Minnesota that have been inherited. You don’t even have to show up and can sell your unwanted house in the comfort of your own home. We can do an email closing with our escrow agent; it makes the process of selling your house very simple. 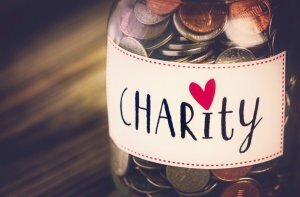 Did you inherit a property and need help turning it into cash? Just grant us access and a way to view the inside of the property and we will take it from there. 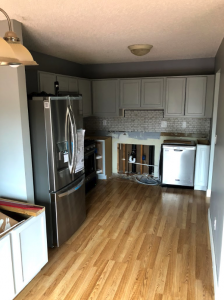 Selling an MN house online has never been so easy. Ryan Buys Houses 4 Cash makes the house-selling experience extremely easy in Minnesota. We help property owners just like you. We buy houses Minnesota in all kinds of situations. From divorce, foreclosure, the death of a family member, burdensome rental property, and all kinds of other situations. We buy houses in Minnesota… including Minneapolis and surrounding areas and pay a fair cash price, fast. 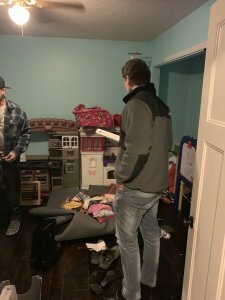 Sometimes, those who own property simply have lives that are too busy to take the time to do all of the things that typically need to be done to prepare a house to sell on the market… if that describes you, just let us know about the property you’d like to be rid of and sell your house fast for cash in Minnesota. If you are tired of putting up with the hassle of owning that house. And don’t want to worry about the time-consuming expense of selling your property the traditional way. You should let us know about the property you’d like to be rid of and sell your house fast for cash. If you need to sell your house fast in Minnesota… We Buy Houses MN and are Minnesota most trusted home buyers. If you’d prefer to talk to someone in our office before submitting your property information call us today at (763) 310-1685.